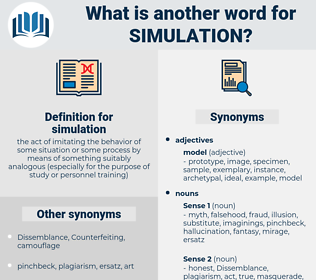 What is another word for simulation? modalities, Simulating, simulated, model, models. 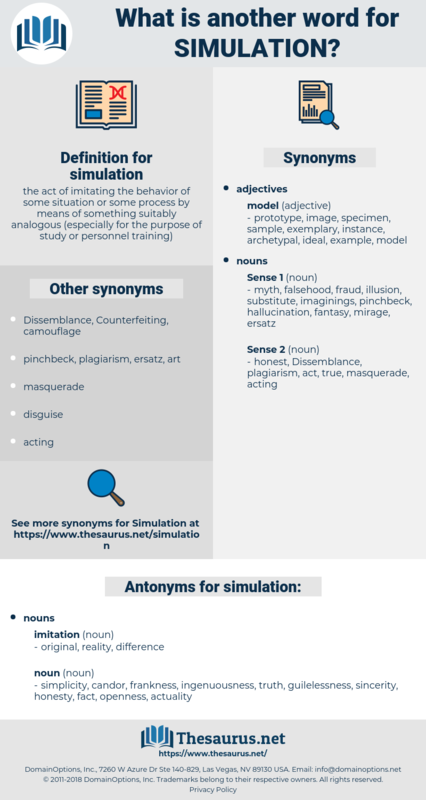 Simulating, replication, imitation, scenario, model. simulator, modeling, emulation, spoofing, simulate, mock-up. simplicity, candor, frankness, ingenuousness, truth, guilelessness, sincerity, honesty, fact, openness, actuality.
" Oh, certainly; trot 'em out," said his brother, plucking up a simulation of interest as he took a seat at the table. The woman fell in a heap at the foot of the steps, uttered a cracked simulation of the cry of a broken heart. restoration, globe, roughcast, figure, mock-up, planetarium.